This book spent so long on my to be read stack, I’m talking maybe five years, and whilst I really wanted to get stuck in and find out everything it had to say I was also a little bit intimidated by it. Over the years I’ve learned to not be so scared by a book and to instead acknowledge that such a feeling means I have something to actually learn from it and struggling over words, concepts, etc doesn’t make it a bad thing but rather shows that it needs to be read in an attempt to be, even just a smidgen, less ignorant than before. I’d like to say that I’m not ignorant about things like agribusiness in Africa, claims of corruption and how empires have a lot to answer for but compared to people that live through the experiences, properly study countries in Sub-Saharan Africa or have some other claim on being able to look into everything in depth I am ignorant. Like so many people I live in my own bubble, focus on the things that the media easily accessible to me talks about, I follow specific things on social media and everything else that is happening in the world completely falls out of my sphere of knowledge. 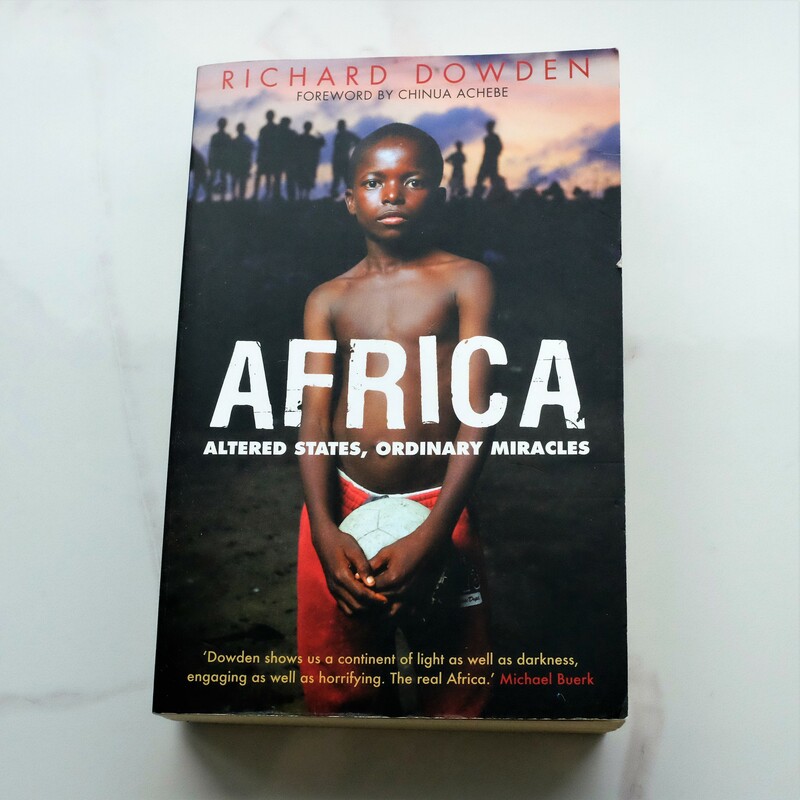 In an attempt to be mildly less ignorant, not able to comment on things but to just be more aware when such conversations do arise, I spent a large amount of time gathering up various books on ‘Africa’ from the recent past to the older periods and have finally started to read them. Africa by Richard Dowden seemed like as good a place to start as any though, even with his varying personal experiences over many years, I felt a little uncomfortable with it being yet another tale of the sub-continent told by a white person originating from a colonising nation but with a foreword by writer Chinua Achebe I figured it couldn’t be wholly awful or he wouldn’t have put his name in it. There are things in this book that I already knew or had a rough insight into before I started to read through the chapters but it provided a more careful view with statistics, quotes and all that other good stuff as well as descriptions of what Richard had seen and recollections of conversations whilst on the ground trying to navigate all the complex situations in front of him. Each chapter shows as a reminder that journalists often have to choose one story to focus on and once they go one way, hoping it to be the right path, there is little room for them to be able to see the other side of the story as well and how that can result in having to make assumptions to fill in the gaps or accepting the numbing story you have in your head is the only one available to putting into words. Having each chapter focus on place, rather than a specific problem such as poverty or corruption, really helped to get an understanding of each of the countries in a more compact and digestible way. Discovering that one issue led to or was caused by another issue helped for there to be a mental timeline in the head rather than you having to pull different chapters together to figure out a coherent path. It did feel like at moments a couple of bits were repetitive but it also allowed for there to be a feeling of connectivity between the places, despite how very different each one is, because of the colonialism, brutal regimes and sudden independence that they have faced for decades and centuries into the past. If you don’t come out of each chapter acknowledging how awful empires are and how horrific capitalism is for long term sustainability and health of millions of people across the globe then I really fear for your soul (or rather the hollow black hole in place of where your soul should be) come judgement day. The honesty of Dowden throughout the book is sort of refreshing. He acknowledges how uncomfortable he felt entering certain places and them either treating him like a god or with great suspicion (though the later is a far more correct approach by those he visited) and the mixture of bewilderment and disappointment that Coca-Cola seemed to have made its way into every village that he seemed to visit. There is nothing wrong with a drink making its way in as such but rather that the drink comes from sugar bought at an astoundingly low price due to the interference of empire, IMF, World Bank and WTO and then gets imported back in at a eye-popping high price that is marketed as a great gift to the people. These are the people that are being the most exploited by capitalist and poor economic policy whilst also trying to fit into the images they see of other nations with people slurping on Coca-Cola and collecting a bunch of tat. These are the people that capitalists claim will be most hurt under socialism but when they have nothing to lose due to the way agribusiness, the green revolution and existing financial powers continue to pinch them and every part of their livelihoods it seems impossible to imagine how they could be hurt any more than at present. But as well as focusing on the ‘hard facts’ of the situation Dowden takes some time to look at the people that he meets and tries to become an analyst of emotions, actions and responses to suggest why some of the suggestions coming from external sources cannot work. These interpretations are based on his time spent with people and he does take the time to have an insight, something people imposing plans and restrictions seem to have overlooked doing and it makes for no surprise that their ideas have not integrated with the people or the governments, but when he enters a place or situation as a white journalist from one of the colonising countries it is hard to know whether the people are acting the way that they always would or if they are putting a different face on and reacting in different ways. This is not to say Dowden’s ponderings on attitudes are automatically wrong or that he hasn’t done enough silent observing from a backseat to piece together the puzzle but there are considerations that we need to remember before fully accepting his narrative of attitudes. Africa is a good starting point as a piece of literature to understand some of the difficulties Sub-Saharan countries, the people, the governments and the economists are facing. It provides a range of angles and helps to broaden the readers considerations from just the typical thoughts and arguments but doesn’t go in as hard against Western society and capitalism as it could. This allows for you to understand the basics before going into the world of reading more news articles, seeking out different media or attempting to read a book that further delves into one particular country. If you have studied colonialism and the impact that it had on now (rightly) independent states you might find some of this to be obvious reading or go “ow yes, I remember reading about that” but it could still be useful as a refresher book to allow you to remember the basics. Have you read anything on these topics that you would recommend? Let me know in the comments below. Follow my on Goodreads to see what I’m reading right now or like my book Instagram for more book related chat. This entry was posted in Books, Culture and tagged africa, book, book blog, book blogger, book bloggers, book review, Books, Culture, geography, history, lblog, lblogger, lbloggers, life, Lifestyle, lifestyle blog, lifestyle blogger, lifestyle bloggers, people, Politics. Bookmark the permalink.